I've here a cool little project that was developed by mrdo, member of the German ArcadeZone Forum. 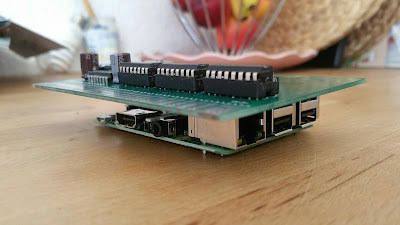 He put together a PCB that supports Jamma Interface for the Raspberry PI. Just put the RPI3 under the PCB, plug the audio cable, attach sd card and throw it into your cab - done. It has native 15Khz RGB support, direct lagless controls, Jamma Interface and 6 Buttons support. There is NO need of USB Encoders, HDMI and VGA converter or Jamma Harness modification. We spilt work - mrdo is delveloping the hardware and cares about the software. Pi2Jamma comes with an own image. I`m in charge of manufacturing and production. - PCB is ordered and currrently at customs. - All parts are ordered and to 90'% deliviered. I notice scan lines missing in Metal Slug....no native resolution in arcade monitor? Sure, different resolutions can be driven by the Raspberry Pi by changing the modelines. Now THAT is a bright little thing ! Looks nice! Can I cut the power to the cab instantly like with most jamma games, or do I need to do a "safe shutdown" procedure in some way to prevent corrupting the sd card? We plan to implement an image with reduced write access. If someone experience fs errors due to switching on /off then the image can be run from usb. That looks awesome I'm very tempted to order one soon. Does it take power from the edge connector or is a separate supply needed? Also how do you connect the controls? There is no modification needed in the cab, no extra psu. Power will be taken from the Jamma interface. 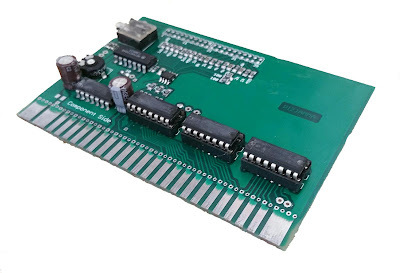 Controls will be forwarded from Jamma interface as well and forwarded to the gpio. and the next 10 pcs. - no modification must be done on the cab. Take your Jamma Harness as it is. This is important if you want to continue using your cab with Arcade PCBs. first batch is sold, 2nd is on the way. Some guys made very nice Graphical Menus für the Pi2jamma. We made progress on the so called pixel perfect resolutions. I general it was not possible to switch resoltuions without editing the config.txt and make a reboot. We have now made a dynamic resolution switcher. It works on the basis of a resolution table for each games. When the game is selected the according resoolution will be sest and the game started. The resoltion table was generated from the roms itself. But sure, the resolutions can be modified in that table to meet specific CRT model and such.